Edward Giovannucci, M.D., Sc.D. is a professor of nutrition and epidemiology at Harvard School of Public Health, an associate professor of medicine at Harvard Medical School, and the recipient of the 2005 DeWitt-Goodman Award for excellence in cancer research from the American Association for Cancer Research. 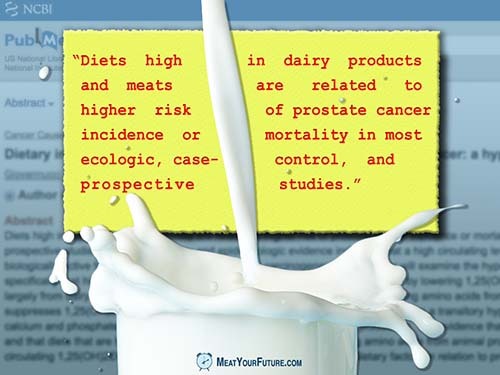 Prostate is the number once cancer in men in the U.S. A plant-based, vegan diet (which includes no animal products) is healthier for both men and women, and significantly decreases risk of cardiovascular disease and certain cancers. Vegan diets are also far more sustainable for the environment, as livestock is the number one source of greenhouse gas emissions, driver of deforestation, water depletion, among other issues (according to scientists from the U.N., World Bank, Stockholm International Water Institute and elsewhere). And, last but not least, shifting away from the unnecessary consumption of animal foods reduces the needless suffering we currently inflict upon billions of sentient animals. Please see the comments for links to the underlying study and our video summary on animal protein and cancer.